Join Diana Award CEO Tessy Ojo as she recounts her day at the wedding of TRHs The Duke and Duchess of Sussex. The day was finally here. It was the night before the Royal Wedding! When I received that invitation all those months ago I was so honoured to be included in this momentous occasion, and even more delighted to extend the invite to our young people who were asked to attend the celebration in Windsor Castle grounds. Youth participation is vital in all our work here at The Diana Award so it was wonderful to be able to include young people in this moment that was sure to go down in history. We all came together that evening for a very special dinner with our young people and staff attending. Each of our programmes was represented with our guests including two Diana Award Holders (including one all the way from Canada! ), two Anti-Bullying Ambassadors and three Mentees, a programme championed by HRH Prince Harry. That night, the young people shared their highlights of the build up to the wedding itself. Disbelief at the invitation was certainly up there, and we all rated our excitement for the day on a scale of one to ten. Everyone shared a rating of at least eleven, myself included. Was this actually happening? The build-up had been tremendous, from the media coverage to the dress dilemmas it was certainly an occasion for The Diana Award to remember forever and now it was actually here. 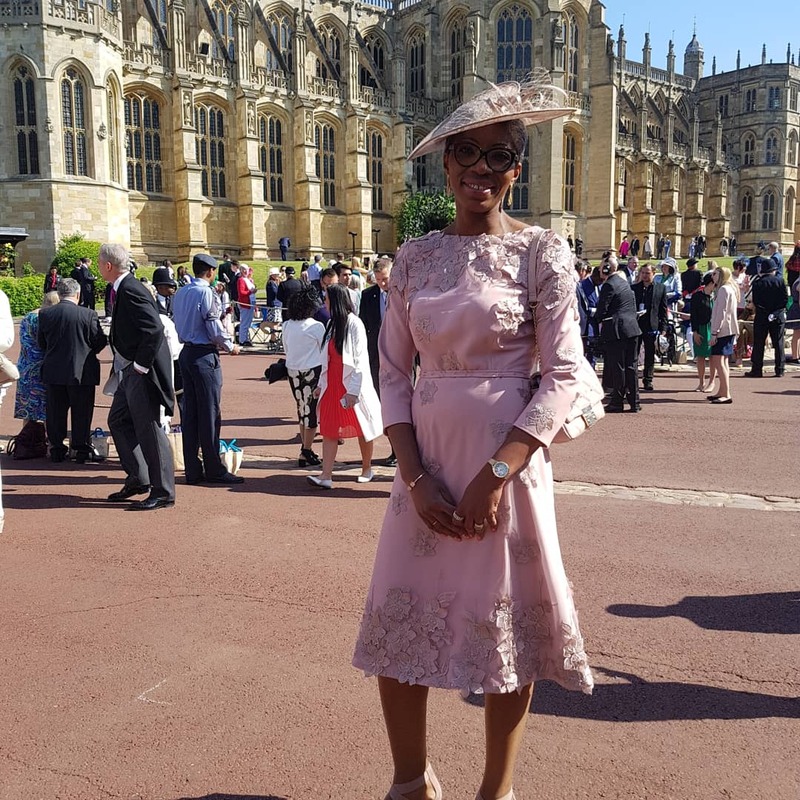 Tessy Ojo, Diana Award CEO, at Windsor Castle ready for the Royal Wedding. With a 4am start the next morning I knew it was going to be a long day, yet somehow I still founds myself awake before then. The excitement was just too much! Just before 5am I headed downstairs to see the lovely Caroline from Powder and Glow who had so generously volunteered to do our make-up that day. I had an early appointment with Sky News to do the paper review and needed to be looking my best! Before long the taxi arrived and I was ready to go. Getting into the taxi I knew that it was the start of more than just a journey into Windsor. History was going to be made, and we were on our way to be a part of it. On Sky News, I was invited to review three different stories that morning and, of course, the one remembering Diana was by far my favourite. This particular paper was reflecting on a quote from Diana “if you find someone you love you hold onto them forever”. It struck me how personal and how very Diana this was and seemed to be just what she would say if she had been with us all that day. There was something quite special about that. I’d like to say my journey to St George’s Chapel went smoothly and whilst it did to some extent there was a little hiccup with my heels getting caught in one of grates – disaster! Thank heavens for the lovely gentleman behind me who helped me free, your support was much appreciated. One of Tessy’s interviews even made it into a gif for the day! We entered the north side of the Chapel and were immediately hit by the magical scent of those fresh flowers so beautifully arranged throughout the church. I was invited to sit wherever I would like and found myself in shock as I looked at the names on the seats around me – Sir Elton John to name but one. Was I really meant to be here? There were a few moments that day where I felt the atmosphere shift. Firstly, when Her Majesty the Queen came in. Even though I couldn’t see her when she arrived, I could sense something change in the room. The second was upon the entrance of the Bride herself. From the moment that she took her first step inside the Chapel doors, a quiet hush ensued. All 600 pairs of eyes were glued to her, completely mesmerised. As I watched her walk up the aisle alone, I found something quite beautiful and powerful in her movement and independence. It felt like this was a woman who was going to change the course of destiny. How can I not mention that powerful address? I found myself amazed at the connections between the words of Michael Curry and the work and ethos of The Diana Award. Social action runs through everything we do here at The Diana Award, and within that is a strong essence of love. A young person’s love for their community motivates them to engage, give back and drive forward positive change. And so more love is created and the cycle continues itself. The power of good and need to do something together is something I see so clearly in the seven young people who joined us at the Royal Wedding, and indeed in every single one of the thousands of young people we work for. There is a clear drive for something more. Then of course we had the vows, hearing the cheers of people outside in the Castle grounds and across Windsor as the new Duke and Duchess of Sussex were announced husband and wife. What a moment. The first reception room we entered was simply stunning, so when we were subsequently ushered into St. George’s Hall I was in awe. The space was beautiful yet still so warm and welcoming. Despite being filled with countless famous faces and of course royalty, I felt as though there were no barriers. We were all there for the same purpose – to celebrate the love of two people – and that brought us together. It was quite surreal. HRH Prince William gave me such a warm welcome, it was fantastic to see him again. Prince William has, for so many years, understood and championed our anti-bullying work, truly understanding the long-term impact that bullying has on the physical, emotional and mental wellbeing of young people. Soon enough though, he was ushered off and so the speeches began! Everyone gave their thanks to Her Majesty the Queen, our generous host for the evening. HRH Prince Charles, in true father fashion, peppered his speech with jokes a plenty ensuring the whole room was filled with laughter! In turn, Prince Harry delivered a moving and emotional tribute to his new wife (cue the cheers!). He thanked his Father and gave a touching welcome to Doria, his new mother-in-law. A heart-warming sight. Of course, the afternoon wrapped up with a treat from Sir Elton John as he jumped up onto the piano. And so ended a historical day. It was a day of hope, filled with promise and optimism for the future. There was something so inspirational and futuristic about it all, a day that I am sure none of us will ever forget. When reflecting on the day now I am truly grateful to the new Duke and Duchess of Sussex on behalf of the whole team at The Diana Award. On their special day they decided to share the spotlight with charities and causes close to their hearts. I can’t help but think it may have been just one of the ways they paid tribute to Diana on their wedding day.